Porcelain veneers are custom made “covers” for damaged, discolored or misshapen teeth. (Veneers can also be made from composite materials.) Porcelain veneers are made from molds and manufactured in a laboratory. They’re stronger than composite veneers and bonding, and they resist staining. Veneers were originally invented for use in Hollywood films, as a special effect! They’ve been in regular use in cosmetic dentistry for nearly 60 years, thanks to advances in bonding technologies. Veneers are laminated onto the surface of a tooth using a special cement. Unlike a restoration, they’re not intended to mimic the tooth’s natural function. They’re primarily cosmetic and intended to improve the appearance of a tooth or group of teeth. A dentist may use a veneer to cover a highly visible cracked, chipped, discolored or broken tooth. 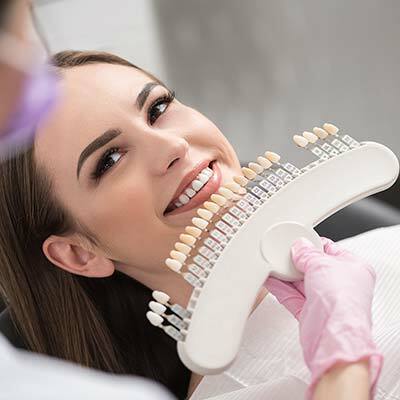 Veneers can also be used to support teeth that are thin or worn. They can also give a set of adjacent teeth the appearance of uniform length or disguise misshapen or crooked teeth.